One of the best ways to learn how to play the keyboards is by enrolling a course or by watching online tutorials. The advent of the internet brought about a lot of interesting material online. Now, you’re just a click away from everything you need to know about playing the piano. This article brings you the reviews on the best place to find free keyboard lessons, which will help you improve your skill! However, before we start, let’s see what you should be aware of when it comes to an online keyboard course. Many people think that an online course will give them everything they need, and that they won’t ever need the help of a tutor. This is not true; working and practicing with a person next to you is beneficial in a different kind of way. Only by combining what you’ve learned in a course with a tutor’s guidance will you achieve extraordinary results. There are all kinds of courses out there, from the simplest to more advanced ones. If you don’t get what you need, it may well mean that you’ve simply chosen the wrong type of course for you – not a bad course per se. Again, there are many different courses – and if you get stuck in a rut, look for a different one, and you may be better off that way. Oftentimes, it’s the little things, such as the online tutor’s voice, that put off many aspiring players from making any progress. The whole idea behind any online course for the piano is to give you entry-level knowledge and enable you to move on with more ease. So, don’t expect to turn into the best player in the world just by spending three months on an online course. In order to become a good piano player, you’ll need much more than that. Now, once we’ve cleared this up, we can move to the actual reviews. Let’s see what the best online piano courses are. If you’re an absolute beginner, this is definitely the place for you. The whole course is constructed like a game, and the interface nicely done. This is great for all those people who haven’t ever played piano, and don’t know where to start. The approach is very intuitive – you have the keyboard and the notes all played out in advance. All you have to do is follow in the guidelines, and you’ll be able to play. And the best thing is that you don’t even have to own a piano in order to play. You can play it on your computer keyboard, by following the required keys. Each key resembles a note on the piano keyboard, and it’s very easy to follow it through. There is also the option of taking a lesson first, before actually playing the song. You get a note-by-note instruction on how to play, and you can practice as long as you feel the need for it. Then, if you’re ready, you can move on and actually play the song in its original tempo. Of course, the beginning lessons are made up of very simple songs i.e. tunes, so you don’t have to worry about the difficulty level. There is also the option of paying for additional features, but it’s not required. All you have to do is create an account and start practicing. As you go along, you will need to upgrade to a sort of premium account, for additional features, but that’s only at a later stage. 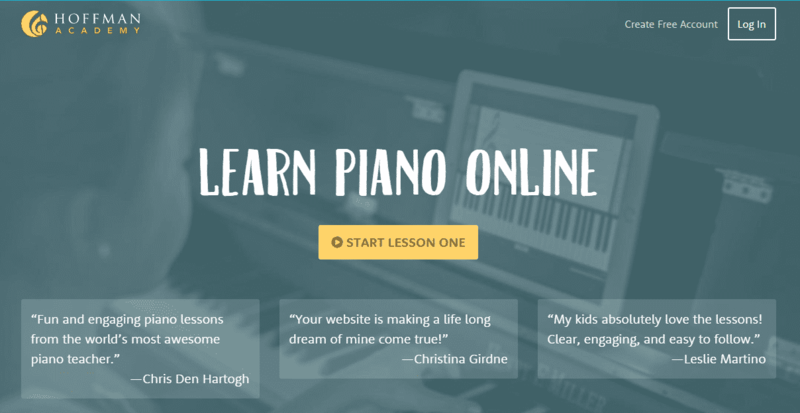 Mind you, this platform was created for absolute beginner, so if you already have some piano knowledge – this is not for you. It offers a basic level of knowledge, so don’t expect any advanced content on it. It is also quite suitable for children, because the whole atmosphere is that of a game. This is also a great place to start if you’re not sure which way to go. There are tons of different courses, for different genres and styles of music. Every lesson is broken down into a separate video, where the tutor explains the details slowly and in a clear manner. Also, you can learn a lot about the art of improvisation, because there are improv lessons within a special, separate course. If you are a complete beginner, then you can really learn a lot of valuable information here. The information is ordered and presented in a way in which you can follow with ease – something that’s very important when you’re starting out. And if you’re somewhat more experienced, there is also a lot here for you, because you are not tied to every single lesson in a given order. You can search up and down, and found the thing you’re interested the most. Although it requires a membership fee, you can opt for a 5-day trial period and learn a lot of useful stuff. This is a great place go get informed on the music theory, musical genres, but also the proper way to improvise on the piano. Some people may find this a little bit confusing, but it’s actually nicely done, and you can learn so many useful things about the piano. Praised by a lot of people, the online piano course from the Hoffman Academy is really something else. It offers you incredible working material, and once you come here you probably won’t ever want to leave. Now, be aware that is also has a paid membership option. However, it’s not required that you opt for it, so you don’t have to worry about additional costs. There is a free version, if fact – it’s one of two plans you can choose (free and paid). The great thing about this is that you are able to access all video lessons for free! As for the lessons, they are highly intuitive and helpful. Before a lesson starts practically, you will get the “lowdown” of the music theory regarding the lesson. Then, you move on, and you have a clear view of the keyboard, with the fingers placed on the exact positions. You have a bird’s eye view of the playing, which significantly facilitates the learning process. The amount of information available here is nothing short of amazing. You have more than 180 lessons, at your disposal, with even some bonus features. Definitely check it out, because it’s worth your time. Again, such a great place to get started. This is a sort of an online database with an enormous collection of learning material. Everything is divided clearly into separate units, to make thing easier for you. You can start off by learning all the basics, in the General section. Here you will find the chord inversions and chord progressions, including exercises for the fingers and the proper way to play the piano. Then there’s a section on scales, where you can find all kinds of scales, from the basic ones to the more advanced ones. Furthermore, there is a theory section, with materials covering note values, time signatures and the way to read sheet music. You can also learn how to count while playing, which is very important for holding down the tempo without speeding a song up unnecessarily. Finally, we come to the part dedicated to “musicianship”, with a lot of useful songs that you can practice playing. There is also an improv section, where you can actually learn how to put to good use all that you’ve learned so far. Every entry in every unit is covered with a video lesson, which is very clear, and easy to follow. Mind you, this whole platform serves as a sort of hallway to a much bigger, and more complex online course - Pianote . This platform is a paid course, but once you cover all the basics offered in Piano Lesson, maybe you decide to move on and buy a course on Pianote. However, if you’re a novice player, Piano Lesson will give you all you need to know at this point. This is one of the oldest piano courses on the internet, praised by many played as a great place to start. It’s very clear and easy to follow. On this platform, you will find more than 50 lessons for the piano, which are separated by their level of difficulty. One of the best things about it is that every lesson is followed by a responding flash animation. By watching the animation, you’ll be able to follow much better and remember the gist of the lesson quickly. You can hear the song, and then repeat it on your keyboard. This is a great combination of fun and learning, which is probably why it’s praised as one of the best piano course out there. It’s important to note here that this particular course is designed for all age groups from 13 upwards. If you have a child younger than this, it’s probably not the best idea to enroll because the child won’t be able to follow it through. However, if you’re older than 13, with or without prior experience, you will have a ball with it! You can start off by learning all the basics, including notation, chords, music theory and techniques for improvisation. In addition to this, you also have tons of other extra material, such as free sheet music, and music tools such as virtual piano, keyboard trainer and chord/note trainer. 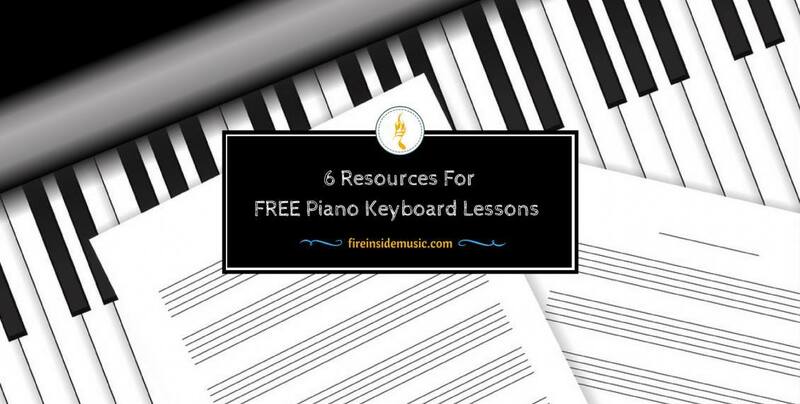 These are all great tools for learning the piano, because they provide valuable insight into all aspects of the instrument. 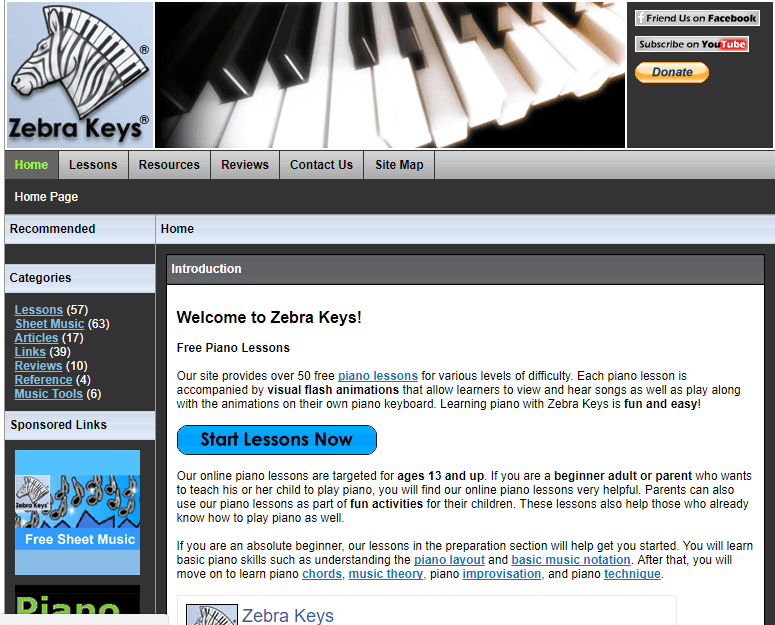 Definitely check out Zebra Keys, because it’s one of the richest resources of piano-learning material you can find. In many aspects, this course resembles the one from Pianu, but it’s more targeted to an older audience. The strongest point on the platform is the graphic design, because it’s very modern and intuitive. In order to be able to play on it, you’ll need a computer that’s made in the last five years, or the systems requirements won’t back you up. Setting up is pretty easy and straightforward. All you need to do is create a free account, but you can also use your Facebook profile to do it. There are all kinds of courses, from the simple ones to more advanced, and they’re very easy to find and activate. You can even access the course if you own an acoustic piano. It’s also great that don’t need a piano in order to start learning – you can access the course even with your iPad that’s connected to the internet. Before you start, you’ll just have to choose how you’d like to play, with your piano or computer keyboard, and you’re ready to go. They have a very good FAQ section, as well as online support. So if you come across any problems – all you have to do is contact someone and they’ll help you out. The only problem with this platform is that, although it’s really good and it offers great learning material, it offers way more features through its premium option. Therefore, in order to make use of all the things they have, you’ll have to upgrade to premium. Other than that, Skoove is a good platform offering fantastic learning material. These are just some of the course out there, and you’re encouraged to check them out one by one. If you’re not happy with what one of them has to offer, move on and find the best match for yourself. Mind you, there isn’t a single course that can cover every aspect of piano playing down to a tee. The best combination is probably to combine at least two courses, and use up all the material they have to offer.